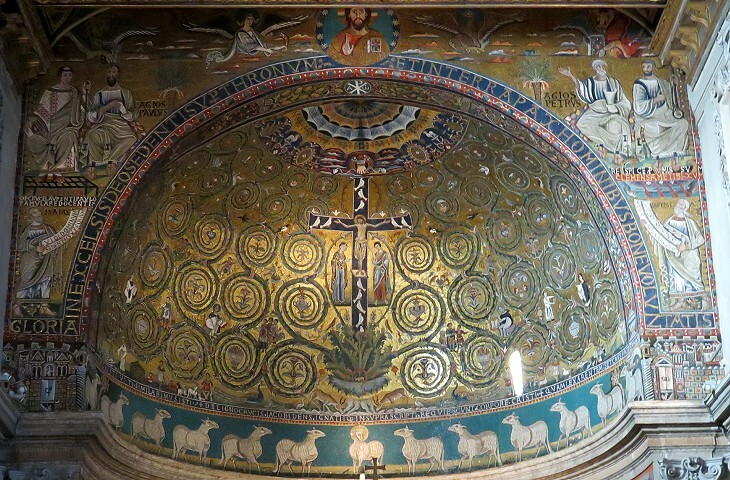 Ravenna is the Italian town with the finest mosaics: its role as capital of the Western Roman Empire and after its fall as capital of the Byzantine possessions in Italy led to embellishing its churches and monuments with golden mosaics rivalling those of Constantinople. The minor role of Ravenna during Renaissance and Baroque periods helped in preserving this heritage as its ancient buildings were not altered to respond to new styles. During the Late Roman Empire (Vth century) and the late Middle Ages (XII/XIIIth century) Roman churches were embellished with mosaics too, but these were often sacrificed by the redesigning/rebuilding of the old basilicas in the XV/XVIIIth centuries. Only S. Paolo fuori le mura, because of its remote location, retained its golden façade, but in 1823 a fire destroyed it. The façade of S. Maria in Trastevere, notwithstanding an XVIIIth century portico and some XIXth century frescoes, is the best example of how the Roman churches appeared at the beginning of the XVth century. 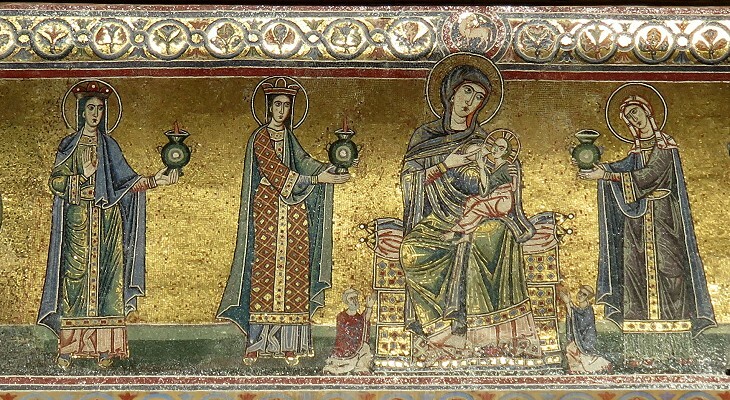 The mosaic shows a Madonna between two donors (portrayed in a smaller scale) at the centre of a procession of virgins. Mosaics decorated not only the façades but also the apses of the most ancient churches and in many cases they have been spared by alterations. 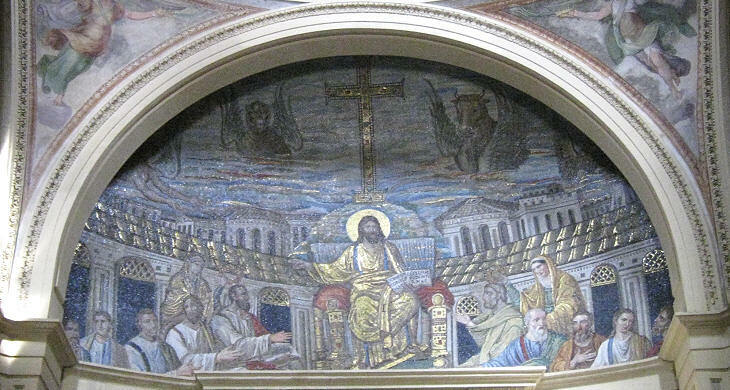 The apse of S. Maria Maggiore is entirely decorated by a XIIIth century mosaic by Jacopo Torriti, who designed the mosaic in the apse of S. Giovanni in Laterano too (this apse was redesigned in the late XIXth century and the mosaic decorating it is a modern work based on the original). The 1823 fire mentioned above spared the XIIIth century mosaic of the apse of S. Paolo fuori le Mura, so that the apses of three out of the four main basilicas are decorated with golden mosaics. It is true to say however that these mosaics lose some of their emotional impact because the remaining parts of the basilicas were redesigned in Renaissance, Baroque or Neoclassic style. 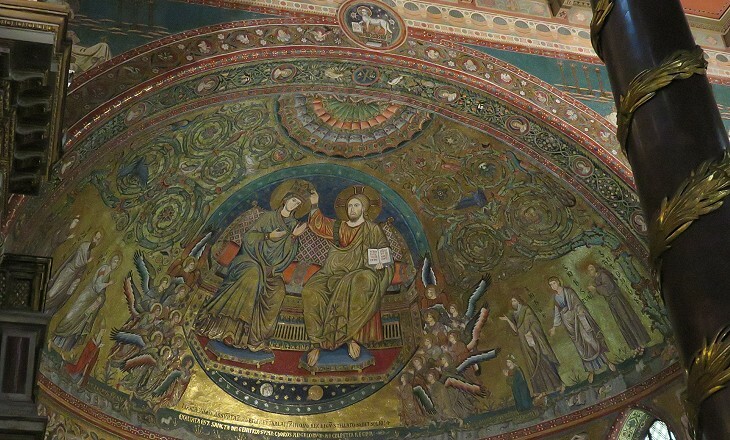 The mosaics of the apse of S. Clemente are less disturbed by changes in the rest of the church and they immediately attract the attention of the viewer. The mosaic celebrates the Triumph of the Cross (a reference to the conquest of Jerusalem by the First Crusade in 1099). The peculiar aspect of this mosaic is its decorative intent. There are no large and severe images of Christ and the Apostles, but an elaborate series of spirals which nest an array of sacred animals and personages (see also the icon at the top of the page). 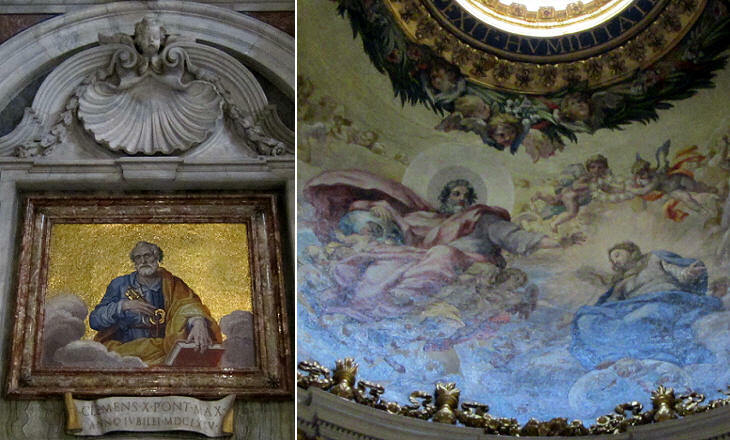 The best known mosaics of Rome are the (modern) portraits of the popes which decorate S. Paolo fuori le mura. The strip starts to the right of the apse with St. Peter and his first successors and it goes through the transept, the main nave and the lateral naves. There are six empty spaces after the portrait of Pope Francis, but it is not the case to read this as an apocalyptic message: the minor naves can accommodate many more portraits. The old mosaic frieze which still decorates the main nave of S. Maria Maggiore was so highly appreciated that all the architects who in various periods made changes to the interior of the basilica were asked not to modify it. S. Pudenziana has the most ancient mosaic decoration in Rome. Unfortunately a late XVIth century redesign of the church led to eliminating two apostles and to halving the bodies of the remaining ones. 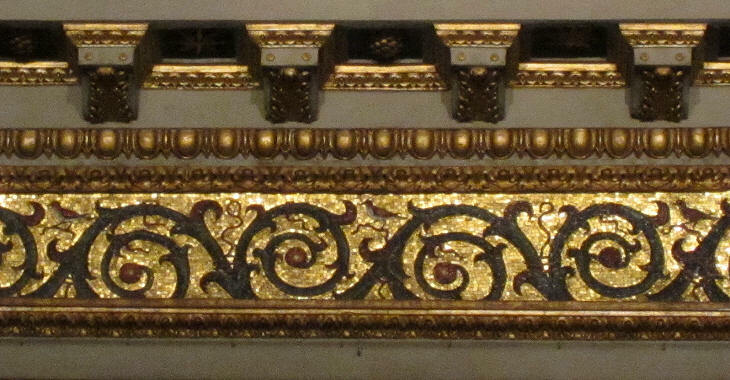 Notwithstanding these shortcomings the design of the mosaic has harmony and perspective amplitude. In 774 Charlemagne defeated the Longobards and put an end to their rule over most of Italy. In the next fifty years the popes with the help of the Frankish emperors strengthened their authority over Rome and the territories which later on constituted the State of the Church. 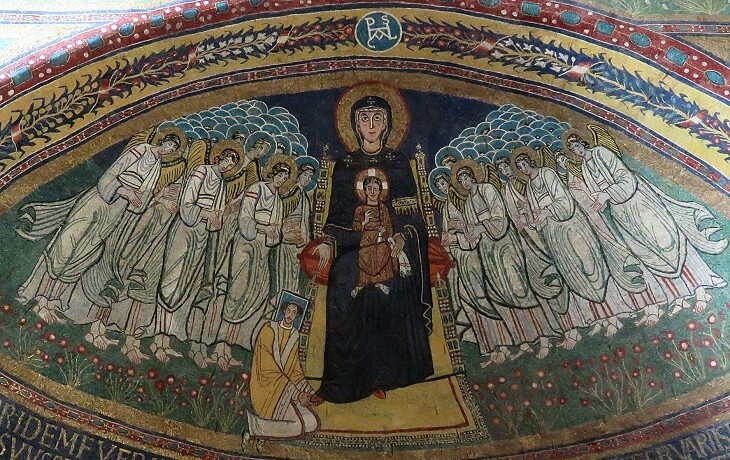 The mosaic in the apse of S. Maria in Domnica is a sign of this period of relative growth. The smaller kneeling figure is Pope Pasqualis I (Paschal) who restored this church in addition to S. Cecilia and S. Prassede. Pietro Cavallini (1273-1321) is with Cimabue and Giotto a promoter of the abandonment of the late Byzantine way of painting. 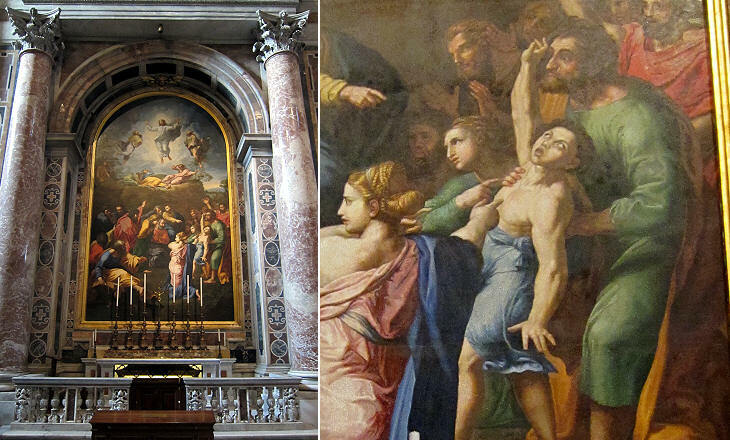 He decorated many churches in Rome and used both mosaic and fresco techniques. Little is left however of these prolonged activities. 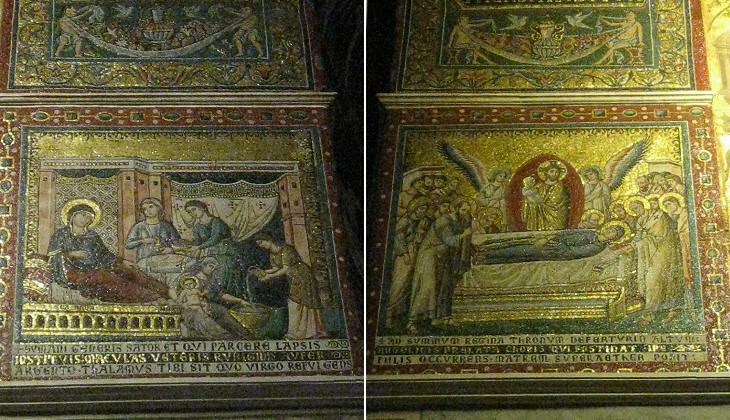 His mosaics in S. Maria in Trastevere showing scenes from the Life of Mary are considered his masterpiece. The scene on the left testifies the move towards a realistic portrayal of figures in space. It was also a sort of swan-song of mosaic, because it showed that this technique was not the most appropriate for depicting a complex scene. S. Pietro Vecchio (old St. Peter's) is the name of the basilica which was replaced in the XVI/XVIIth century by S. Pietro (Nuovo). The popes who made the decision and who actually carried on the project were conscious of the gravity of this change. To diminish its effects they asked the architects who designed and decorated the new basilica to include reminders of S. Pietro Vecchio and as the decoration of the old basilica was mainly based on mosaics, S. Pietro (Nuovo) is mainly decorated with mosaics too, although in many cases this is not immediately apparent. The whole inner dome is a gigantic mosaic with a golden inscription starting with the sentence upon which the Roman Catholic Church based its supremacy (TU ES PETRUS ET SUPER HANC PETRAM AEDIFICABO MEAM ECCLESIAM - you are Peter and upon you (this stone) I will erect my church) and going through the lateral naves and the main nave. The figures, following the old tradition, are isolated on a golden background, but they have nothing of the Byzantine composure and rigidity. 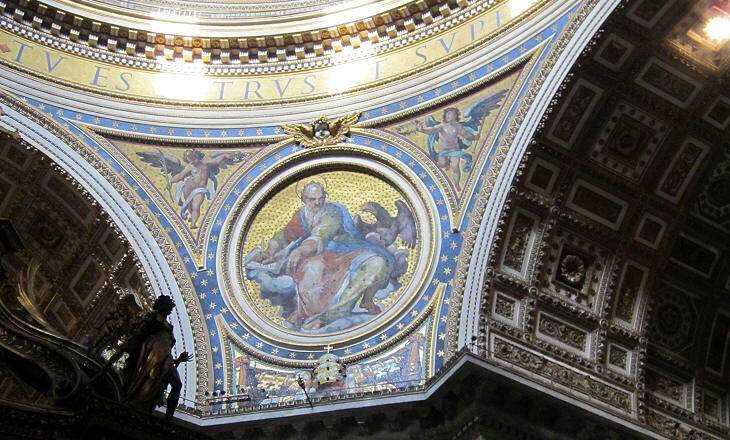 The altars of the basilica are decorated with copies of celebrated paintings. 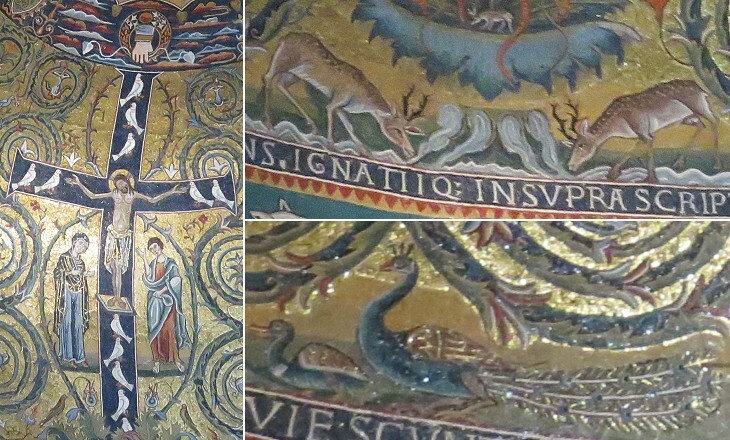 Only a close look at the nuances in the naked parts of some characters shows that the reproduction is not painted but it is a mosaic, as the shades are clear cut. The high level of skill reached in doing these copies was used also for some original works based on cartoons drawn by famous painters. Ciro Ferri and Carlo Maratta were among the most acclaimed painters in the last decades of the XVIIth century. In 1743 Pope Benedict XIV commissioned Ferdinando Fuga the erection of a sort of apse with the objective of displaying there copies of the IXth century mosaics which once decorated the banqueting hall (Triclinium) of Leo III in the old Lateran Palace. 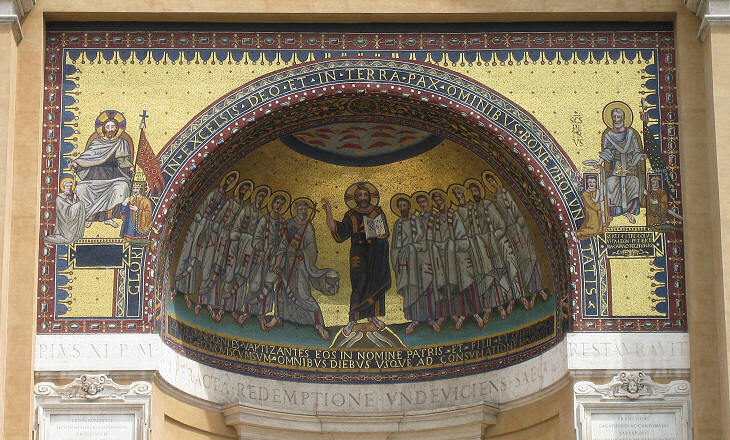 The main mosaic shows Christ sending forth the Apostles to preach the Gospel. The two lateral mosaics are of great interest to historians as they show to the left Christ with St. Sylvester I and Constantine and to the right St. Peter with Leo III and Charlemagne, a clear attempt by Leo III to compare Charlemagne to Constantine and to renew the so-called Donation of Constantine, a (fake) VIIIth century document stating that Constantine had given to the Pope temporal powers. 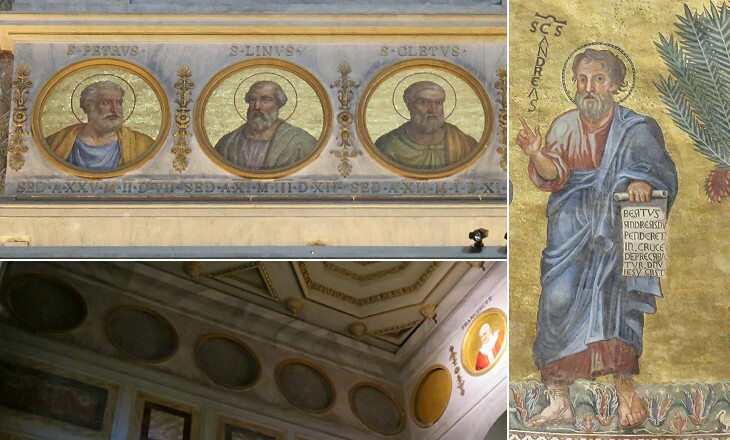 It is also interesting to note the Greek use of the letter "B" in the last word of the inscription surrounding the main mosaic: Boluntatis rather than Voluntatis an indication of the large influence of Greek monks and priests in IXth century Rome.